Part 1:Credit Card vs Debit Card Decline Rates: Are Credit Cards Worth the Processing Fees? "There is not much merchants can do about credit card declines" is probably not the best start for an article about lowering decline rates. Nevertheless, it is not far from the truth. Almost half of the declines occur due to the cardholder's lack of funds. Add to this the variety of preventative measures by banks and financial institutions to fight fraud, many of which lead to declining otherwise legitimate transactions.On the other hand, the very little we can do can still have a significant impact on optimizing our payment processing and eventually saving losses, in particular for the organizations that have not paid much attention to the data they collect and pass it on to the payment gateways. In this article, we aim to help merchants avoid the common pitfalls in handling payments by raising awareness about and identifying factors with profound impacts on the declines. We also provide simple suggestions to raise the approval rate of credit card transactions. As a frequent credit card user, you may experience a decline if you exceed the card limit, use an expired card, make an international transaction or a big purchase, or use your card for the first time at a new merchant away from your local geography. When this happens, you may retry with the same or another card, use cash, call your credit card company or change your mind about the purchase. For merchants and banks, however, the story is more complicated. For the merchant, a declined transaction could mean a lost sale if the customer changes her mind about the purchase. To estimate the merchant's true cost of declined transactions, factors such as the customer acquisition cost, customer lifetime value and impact of declined or blocked orders should be taken into account. For example, lowering or eliminating declines leads to an increase in cash flow and better customer relations, all while lowering card processing fees. For the card-issuing bank, on the other hand, the biggest risk is when declined transactions encourage customers to switch to a different card. In fact, accounting for being estimated between USD $3,600 - $48,000, the impact of losing a customer goes well beyond a lost sale. Merchant's ability to fully understand, measure, and lower the declines are limited by several factors. First is the lack of control over the payment processing. As argued by David Goodale. The gateway is mostly protecting the merchant while the bank declines the transaction to protect the customer's best interests. There are measures merchants can take in order to increase the approval rate by the payment gateway while there is not much that can be done about card-issuers. The second factor is our limited ability to learn from declines. This is due to the fact that for fraud-prevention purposes, the issuing banks leave the transaction messages vague. While some declines are followed by messages like insufficient funds, many others are generic messages such as do not honor. Therefore, merchants can only speculate about why those transactions got declined. The third problem is data. I compared the decline rates of credit vs. debit cards based on the card brands, issuing banks, and the currency of transactions and found that in each category, credit cards have a lower rate of declines. The analysis of millions of transactions showed that credit cards have many advantages over debit cards for both customers and merchants and despite their higher processing fees, it is to the benefit of merchants to encourage and accept them. In this work, we take a further step towards a frictionless payment experience. In this work, I dig into the decline causes which we can act against. On the one hand, we do understand that the complex issue of declines does not have a simple solution. On the other hand, we believe that due to the scale of this problem, that costs banks and merchants multi-billion dollars annually, any incremental improvement in approval rates can lead to significant results in the revenue generation, customer satisfaction and churn reduction. comprise 44% of the $145 billion in transactions that are declined annually, are in the first category. reports that 5.58% of their customer's declines are due to invalid addresses, a cause that can potentially be avoided by using Account Verification service (will be discussed later). The impact of other factors varies by the card brand and the country. In the following sections, I will focus on the first two items on the list above, expiration dates and valid addresses, namely, and investigate their effects on declining/approving a transaction. What percentage of transactions merchants can save by investing time and resources to make sure that, for example, the cards are not expired or the credit card information is up-to-date and which factors do not impact the approval rate significantly will be discussed in further details. To start, let's review the assumptions used in this study. In our analysis, I consider two transaction types only. In Purchase, the order is fulfilled immediately while there is a delay in order placement and fulfillment in Authorization (+ Capture). Out of hundreds of millions of transactions in Spreedly's database that have been processed since January 2016, I filter almost 10 million transactions in USD currency from 5+ million credit cards issued in the United States. Banks and gateways use different models and policies and provide merchants with different settings and options when it comes to processing transactions. Therefore, any analysis requires breaking down the numbers to bank-gateway level. Here, I consider top issuing banks and gateways in Spreedly's database with at least 500k transactions in USD by US cardholders. The list of banks and gateways are given in figures 1 and 2, respectively. American Express is included in the list as one of the top card issuers. Discover did not make it to the list. I do not take into account the subsequent declines from the same credit card during a one-day period. These transactions are denied for reasons different than what we are interested in here. The times are all converted to Eastern Time. So transactions at 6 am Pacific Time, and transactions at 7 am Central time, are all grouped with transactions that took place at 9 am ET.
. In a future blog post, I will write more about using BIN database for financial analytics purposes. We break down the Authorization and Purchase transactions into a bank-gateway level and look for the possible differences in how they handle transactions. We also check the effects of the amount and time of transactions on their decline rates. The ratios of declined to all transactions in bank-gateway level are listed in Table 1. The last column, Mean(Gateway), is the average decline ratio for each gateway. Likewise, the last row at the end of each transaction type, Mean(Bank), is the average decline ratio for each bank for that transaction type. From Table 1 we see that purchases experience a higher ratio of declines. For authorizations, banks and gateways have done a great job keeping the declines as low as 3% of the overall transactions with the exception of Vanitv with 7% of decline rate. The combination of Vantiv-Bank of America and Vantiv-Capital One decline ratio is as high as 9%. In purchases, on average Capital One declined more transactions. While the other banks average around 3-4%, the declined transactions by Capital One peak at 6%. The largest decline for bank-gateway combination belongs to Authorize.net-Capital one with 11%. The next noticeable large decline ratio, 9%, belongs to Capital One-Stripe. The excellent performance of American Express in handling both transaction types may be due to the fact that, in this case, the card brand and the issuing bank is the same. Among gateways processing USD purchases made by US-issued cards, the highest decline rate belongs to Stripe. 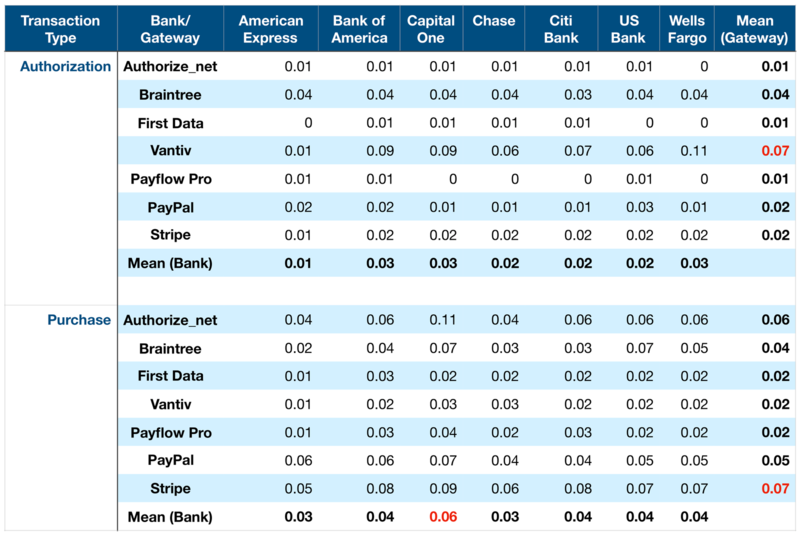 While Stripe maintains a higher decline rate for all the issuing banks, it reaches its lowest decline when processing American Express cards.
. One reason is the low volume of Capital One, Chase and Citi cards processed by PayFlow. To check the relationship between declines and transaction amounts, I studied the decline rate of transacted amounts, grouped into four categories of less than $99, between $99 to $999, between $999 and $9999 and greater than $9999, as shown in Figure 3. The analysis of decline vs. amount clearly shows different trends for authorizations vs. purchases. The largest decline ratio for purchases takes place in the first category, i.e. for amounts less than $99. It then drops down to 5% and remains the same for the next three categories. The decline ratio for authorizations, on the other hand, has the lowest rate in the first category, slowly rises by 2% and 4% in the second and third categories and spikes at the noticeable 23% in the last category. The dashed lines show this trend for Purchase and Authorization transactions. When do most declines happen? Are the declined transactions uniformly distributed or it fluctuates over time? Fig. 4 is the plot of the ratio of declines vs. the hour of the day for three classes of transaction amounts. The larger the orange circles, the higher the decline ratio for that particular hour (Eastern Time). From Figure 4, one can identify danger and safe zones for transactions. The transactions, independent of their amount, experience a higher decline before noon. From afternoon to midnight, the decline rate decreases significantly. Though Authorization and Purchase declines do not peak at the same hour (the plot is not shown here), they share the same safe and danger zones. (page 3, Fraud Rate as Share of Transactions by Time and Day 2016) shows that the decline rates in Fig. 4 are not all fraud-relevant (though one should note that these two plots are not exactly the same). Therefore, a portion of the declines can be related to other factors, some of which are of our interest in this article. Figure 4 suggests that for merchants that batch-process their payments, moving the scheduled time to the afternoon can potentially affect the decline rate. Merchants can also consider pushing out big sales/promotions at lunchtime so customers are buying in the afternoon, vs. first thing in the morning. , due to higher holiday spending. After looking at the some of the general trends for declined transactions, in the next section, I look into the decline causes that can be avoided or fixed. A few parameters that merchants can control are the expiration dates of the credit cards they're running as well as making sure the cardholder's address is valid. Merchants can use different means to make sure the cardholder's records and the card's information are up-to-date. How important is the role of expiration dates and valid addresses? Is it worth the time and resources to keep these records current? To find transactions made by expired cards, I compare the credit card's expiration and the transaction dates. As you will see, the data shows that payment companies (brands, banks, gateways,) take the expired card transactions very seriously. In fact, they decline them, but not as often as you might think! 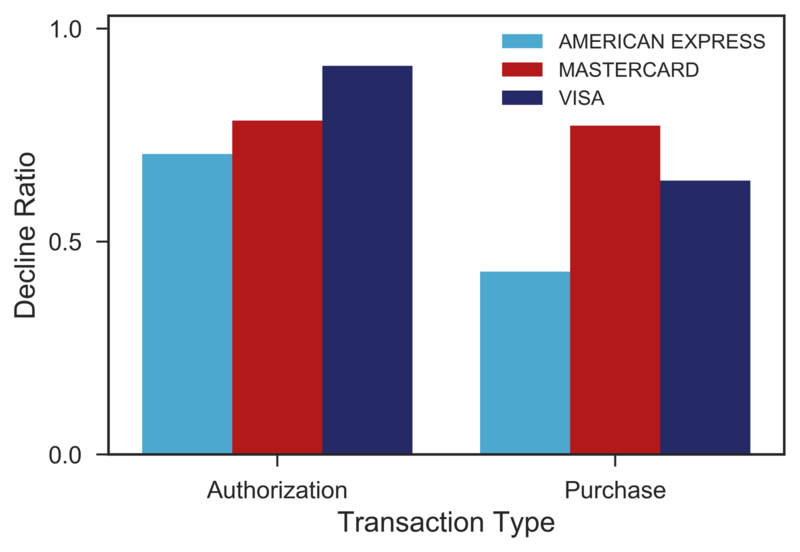 For instance, let's look at the decline ratio of Authorization and Purchase transactions by expired Visa, MasterCard, and American Express cards (Fig. 5). For both transaction types, the decline ratio is quite high. On average the authorizations transactions are rejected more than purchases, though. Visa and MasterCard are rejected more than 50% of transactions for both transaction types. The lowest decline rate belongs to purchases made by expired American Express cards. I should point out that, in Spreedly's database, purchases with expired cards are about 20 times more than the counterpart authorizations. One reason is that, for recurring charges, the card is authorized only once and it is the first time that the card is used. If authorized successfully, the card will later be used to capture the amount without re-authorization. Table 2 shows the decline rates of expired cards for brand-bank pairs. Authorization and Purchase transaction numbers are presented separately. The last column, ratio, already discussed in Fig. 5, is the average decline rate for the card brands. The first noticeable observation in Table 2 is the high ratio of declines almost across all bank-gateway pairs. The lowest decline rate, which belongs to purchases by American Express, exceeds 40% of transactions (except for US Bank). For the rest of brand-bank pairs this ratio exceeds 60% and in some cases such as Visa-US Bank, Visa-Wells Fargo, and MasterCard-Capital One, the ratio tops 90%. In other words, 9 out 10 transactions have been declined; something that clearly emphasizes the significant role of expiration dates on approving/declining a transaction. The good news is that merchants can use Account Updater to keep the credit card data up-to-date. Account Updater, a service that is supported by the major credit card brands, connects to the issuing banks of the cards and refreshes the card information, helping save merchants from revenue loss and declined transaction-related costs. on lowering declines, saving revenue and decreasing churn is the topic of future blog posts. We looked into the cardholder's address data, including street, city, state, zip, and country and how they affect the decline rates. The country records are verified by comparing the customer country input with BIN database. However, the measure to verify city, state and zip is solely the lack or existence of these records in Spreedly's database. We should point out that for Address records, the only input we can verify, using the BIN database, is the country record. For street, city, zip, and state, we only compare the decline rates between the transactions with, and without this records. A significant difference in the decline rates between these two groups was not observed. For the country records, I only consider the Country records with the frequency (appearing in the data) of greater than 50 times. Our data show a high ratio of declines for transactions - mostly processed by the Authorize.Net gateway - with the wrong country code. DE (Germany) and ES (Spain) experienced 96% and 90% declines, respectively. Another observation is that payment processors are not sensitive to the different variations of the United State (United States, US, USA,) names in their records as they all received high approval rates. , according to which address-not-verified accounts for ~ 6% of their declines. Among the variety of reasons that lead to a declined transaction, some can be changed or controlled by merchants. This study targets some of these factors and weighs their impact on decline rates. I used around 10 million transactions by 5 million credit cards issued in the United States and investigated the relationship between several controllable parameters by merchants and the decline rates as well as general trends among declined transactions. All the transactions are in USD currency and were processed via US-based gateways (Figs. 1 and 2). From Fig. 4, the safe and danger zones for transactions can be identified. Safe hours are from the midday to midnight (Eastern Time) when the decline rates are significantly lower compared to the danger zone. We also observe the high decline rates for transactions with the wrong country codes, however, due to the small number of these records, we cannot make a conclusive remark. Our overall declines due to the addresses match Recurly's. Because it looks a lot like card-testing (when fraudsters test the validity of a card with an unsuspecting merchant before selling the card for misuse) banks are suspicious of $1.00 authorizations and many decline transactions with merchants that perform them. So, a tactic merchants were using to fight fraud has evolved into an indicator of fraud. offered by Visa and MasterCard. As a final note, the author is aware of the uncertainties in this study: for example, I have not taken into account the role of merchant categories. However, we hope that this analysis provided actionable insights for lowering the decline rates and encouraged merchants to keep the credit card information up-to-date and, in particular, make sure they run transactions using the cards that are not expired. At the end, I agree with Verifi that the ultimate solution for better payment processing requires further collaborations between merchants and the issuing banks.